This season the Danish cycling apparel company Pas Normal Studios partnered up with LTP to launch the new long sleeve men’s jersey which is a new addition to the well-known Mechanism line. It is designed as a race fit jersey and in that way classic Pas Normal Studios styling. It is technically designed to bridge the various weather conditions in the spring and summer. Pas Normal Studios worked closely together with LTP in order to produce this garment. “For us, it is a real pleasure to work with Pas Normal Studios, first of all, it is always a great challenge to work with, and produce quality cycling products. And also the people behind Pas Normal Studios are very professional and nice to do business with” says Alex Ingildsen from LTP. Technically there are different technologies applied; Bonded hems which give the jersey a very clean look. The zip flap is cut out by a laser cutter and therefore extremely precise. The lower elastic waistband on the back hem is custom made with a bonded silicon text saying “Road to Nowhere”. The back feature a big transparent text print that fits the style of the Mechanism line. Read the article about the cycling apparel categories here. 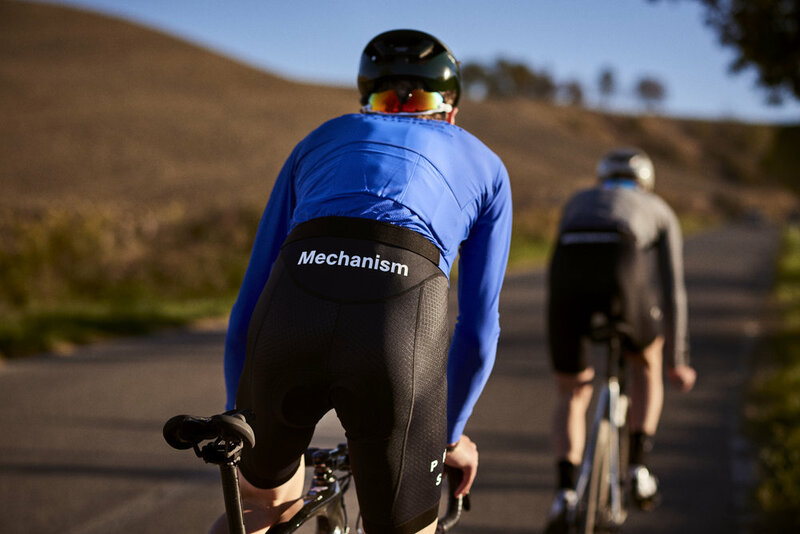 Pas Normal Studios is a Copenhagen based brand of contemporary, technical cycling clothing. The concept of Pas Normal Studios is to create technically perfect apparel, combined with visionary aesthetics. Through innovative designs, brand collaborations and sourcing of new production methods, Pas Normal Studios strives to bring out collections that define modern cycling in a different context. The brand honors the great traditions of cycling, but is above all committed to the patterns and colors that define state of the art fashion today. The uncompromised attention to detail and hand-made, sustainable quality is paired with an inspired take on today’s look and feel. Pas Normal Studios produces high-end clothing with textiles and methods at the same level as demanded by professional riders – but at the same time, all styles created for long-term usage and durability. LTP is a Danish-owned garment manufacturer for 60+ premium brands within active sportswear, outdoor, athleisure and sustainable fashion. LTP was established in 1991 and is probably the biggest functional garment manufacturer in Europe with bluesign® setups in Lithuania, Belarus, Ukraine and Vietnam.